Local Search Engine Optimization is one facet of traditional SEO that focuses on searchers with local intent rather than those trying to target specific keywords or topics. This is a very important part of SEO if you have a business which sells its products or services locally. 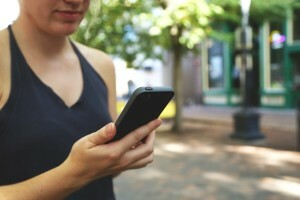 Both Google and Bing have reported that over 20% of desktop and about 50% of mobile search queries have local intent! That is a huge amount of potential customers for your business if you successfully implement local SEO. 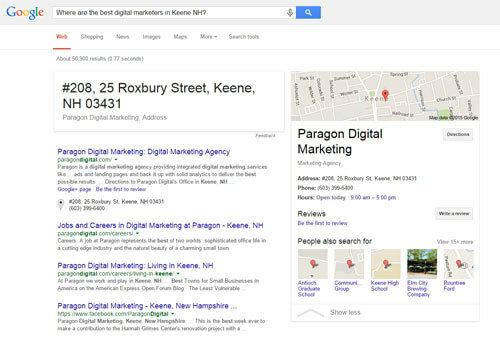 Where are the best digital marketers in Keene, NH? The main intent of local SEO is the creation of local business listings on local directory sites. These directories are generally free to set up a basic profile, but some have a paid option for more enhanced listings. Each listing that you create for your business increases the chances of you being found. But it is very important to have consistent information across all of the listings, as well as your local information on your website. Have a business name or DBA. Have a local phone number that matches your city of location (not a shared phone number, toll-free number, or call tracking number). Have a dedicated physical street address (not a shared address, PO box, or virtual office). Make face-to-face contact with your customers (business is not conducted virtually). You can check your businesses listings and see what data is missing using the Moz Local Tool. Reviews and ratings are a great way for customers to continue the conversation about your local business online. It gives them a chance to show their appreciation for your business as well as critique any problems they may have encountered with your product or service. It is important to always respond to negative reviews and try and do some conflict resolution. Having a negative review with a good response and resolution to the problem can potentially be more beneficial than only having perfect 5 star reviews. It may not be as important to respond to positive reviews as it is negative, but it is a very close second! By responding to positive reviews that can actually encourage other people to review your business because they have seen that you check and maintain a presence on the review site. Local SEO isn’t just about getting reviews and local listings on the web. It all ties back to your website! First off, you need to have something to optimize, so you must create some local content! Here’s a few ideas to help prompt you to create content. What are your customers looking (searching) for? What is unique about the areas you serve? Previous projects that you have worked on. Testimonials and interviews with customers. Each page should target a specific key phrase or group of related phrases rather than having one large page that talks about many different things. Now that you have content ideas you must organize them effectively. Your most important content should be featured on your homepage, and in your navigation bar at the top of the page. You want your products or services to stand out! Another way to help your content be found is to internally link to these pages from within the content of your other pages. First things first. Your website must be mobile-friendly. An ever increasing amount of users are accessing your site from a mobile device, especially users that are looking specifically for local content. Being mobile-friendly can even help you rank higher in Google search. Make sure your phone number is in the footer of every page. It is even better if you put it in the header too, making sure the number clickable on mobile and not hidden in an image. Start every page off with a descriptive headline so your visitors know they are in the right place. The headline should align with the specific goal of the page. Don’t let your pages become too text heavy, add in some sub-headings and images to make the pages more readable and skimmable. Next Step: After you optimize your listings and website for local, the next step is to start building a social media presence. If you have any questions on local SEO let’s continue the conversation in the comments below.